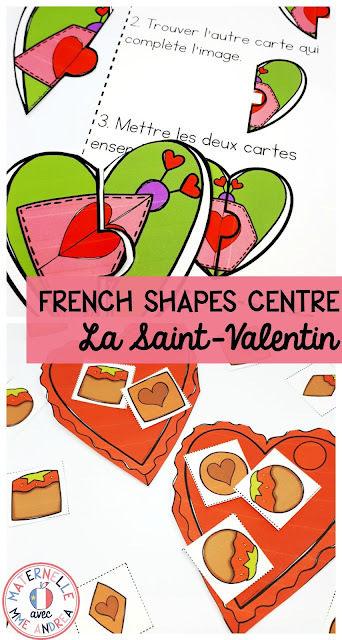 It's almost Valentine's Day, which means lots of love and hearts in my classroom - and my centres! I run a literacy centre rotation every day in my classroom, and my students have free choice of math centres at the end of our math block. So, I am always looking for new, fun ideas that incorporate the current seasons and holidays for our centres that are developmentally appropriate, practice key kindergarten skills, AND that are en français. Read on to see what I will be putting out over the next couple of weeks! I am just coming back from mat leave, and I am not 100% sure yet where my students are all at because I haven't been teaching and evaluating them all year. I have only been back for a few weeks, so I will be putting out some fairly simple centres that my students can use to practice skills independently. Later on in the year, I will add more games and activities that have more complex instructions and that work on more difficult skills. I don't know about you, but my students are always still inverting numbers at this point in the year! The more I can get them to practice their numeral formation, the better. I always add tracing strips at the tops of their worksheets, but I will be adding more tracing practice to our February centres. Dry erase markers make it more fun, anyway! 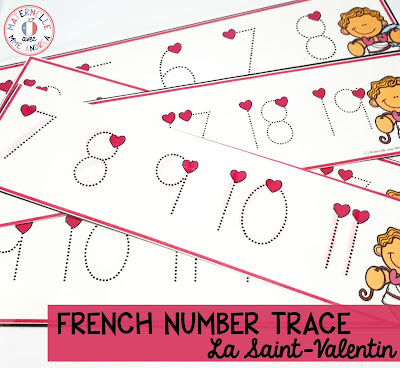 These number strips have hearts at the top of each number to show students where to put their marker to start. There are a variety of strips that go from 1-20 and will help solidify correct number line order, as well. I like these strips because they are another way to get students practicing writing their numbers while also working on other stills. Students will either write the missing numbers on the number line, or write which number comes before and after on the number card. 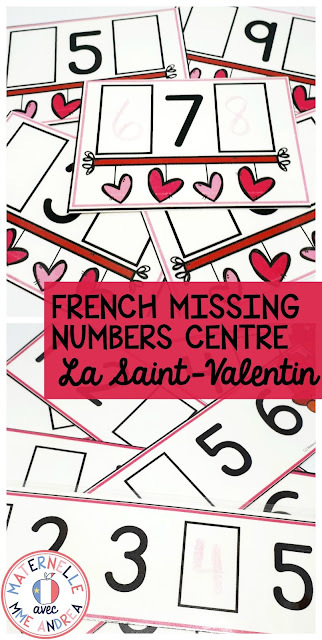 I will also provide my students with some Valentine's Day-themed manipulates to help - they sometimes find it tricky to think about what number comes before. Manipulates allow them to build the number and take one away to see what is one less, or add another to see what is one more. We are learning about 2D shapes right now, so I will have two shapes activities in our centre bins. The first activity is to help my students think about what each shape looks like - they will use their knowledge to put together love bug puzzle pieces. Our shape outcomes also ask that students be able to sort as well as describe shapes, so I like to provide them with lots of opportunities to practice sorting. These 2D shapes sorts will have students sorting the "chocolates" into the correct boxes. We still need lots of number sense work! 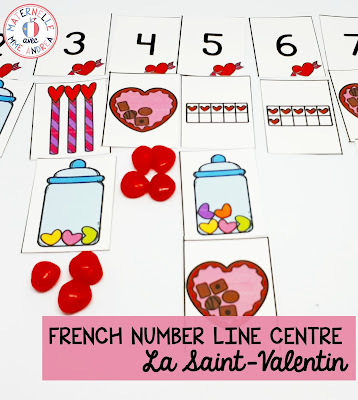 During this activity, students will use the numeral cards to build a number line from 1-10. Then, they will add the other cards underneath that represent the correct quantity. Lots of counting practice here! I will also give my students various themed manipulates and ask them to add the correct quantities underneath each number using the manipulates. I also always provide my students with a variety of 3D shapes, blocks, snap cubes, pattern blocks, and other materials that encourage them to build, explore, and play! Here is a link to some FREE Valentine's Day pattern block mats that I have in our pattern blocks bin right now. During literacy centres, I like to have my students work in groups of two. You can read more about that here. I find that having groups of two works really well for games! Here are a couple of games my students will be playing over the next few weeks. EEK! Coeur brisé - This game is like the game Bang!, except there is a game board and a die instead of just drawing cards from a cup. Students roll the die and if they can say the name of the letter or the sight word beside that number, they get to keep the card. If they roll an EEK!, all the cards go back in the bag. Youpi! 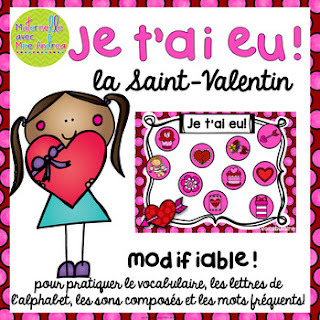 La Saint-Valentin - Most of my students don't know all their letters yet this year, so we will be playing this game to help us remember which uppercase letters match which lowercase letters. Each partner places five cards face up on the table. Then, one at a time, they draw a card from the deck. If they have a match, they flip a card and yell "Youpi!" The first partner to flip all five cards wins. Je t'ai eu! - I like to use this game for vocabulary practice. Each partner has their own colour of snap cubes. They will roll a die and then choose one vocabulary word to say beside that number. They can put a cube down on that picture (if they know what it is en français). If there is already one cube down, the other partner can bump them off. If there are two cubes of the same colour, then that word is "locked" and no one can bump them off. The winner is the student with the most "locked" words at the end of the game. 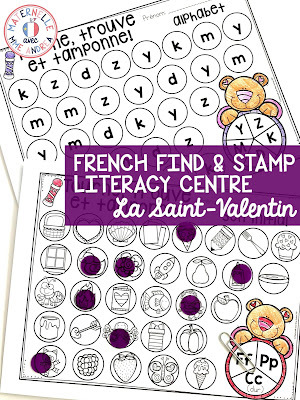 You can also play this with letters, sight words, sons composés, anything! 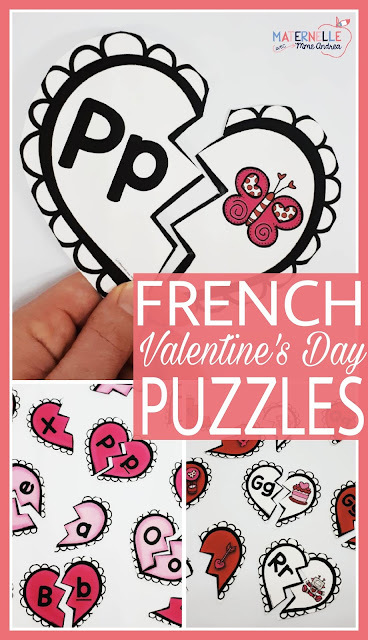 Broken hearts are great for Valentine's Day puzzles!! This set has upper- and lowercase matching and beginning sound matching. To make them self correcting, I put stickers on the backs - one half of each sticker on each piece. We will be using the beginning sound matching puzzles this year. We are also working on building sentences with our pocket chart. This centre works well with two students, but may be harder to manage with more than two. One student builds a sentence using a model, then the other reads it (using my special bâton magique!). Then they switch jobs and choose a sentence to write and illustrate. All of these centres will require lots of modelling and teaching before your students are able to do them independently - but they should be able to be successful! If you are interested in reading more about how literacy and math centres run in my classroom, I wrote a whole series about them last year on my blog. 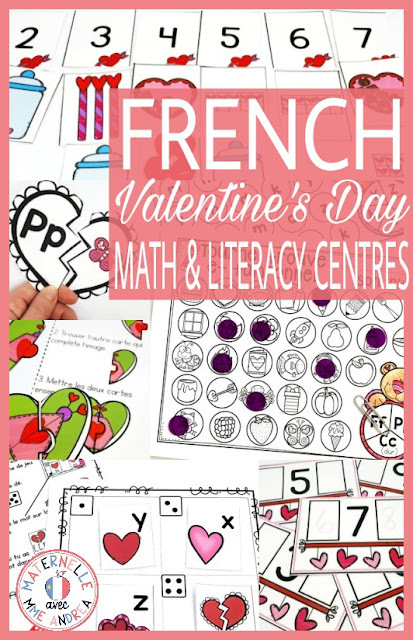 Start here for literacy centres and here is a post about what my math centres look like. If you are wanting to purchase any of the centres I have shown in this blog post, just click on the name of the centre or on any picture to be taken to them in my TPT store.